Family owned and operated winery, established in 1976. Located near the nationally recognized historic town of Jacksonville, in the Rogue Valley of Southern Oregon, Valley View was originally established by pioneer Peter Britt in the 1850’s. The wineryended with Britt’s death in 1906. The name was restored in 1972 by the Wisnovsky family for their vineyard and winery planted in the beautiful Applegate Valley just nine miles from Jacksonville. The Applegate and Rogue Valleys offer a large variety of soil types and microclimates that allow a great diversity of grape varieties to be grown. Because the Applegate Valley is considerably sunnier, warmer and drier than elsewhere in western Oregon, Valley View concentrates on Cabernet Sauvignon, Merlot, Viognier, Syrah and Tempranillo at our estate vineyard. 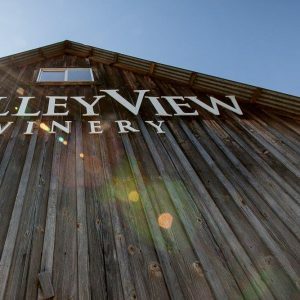 Valley View produces a variety of wines which will please every palate. The Valley View label represents premium quality wines at very affordable prices. The Anna Maria label represents the finest wines produced and is only available in the best vintages. Viognier, Tempranillo, Sauvignon Blanc, Cabernet Sauvignon, red blends and white blends, dessert wines including our medal winning Late Harvest Sauv Blanc. We also make Cab Franc, Merlot, Malbec, Syrah, Riesling, Chardonnay, Marsanne, Roussanne, Tempranillo Port, Tempranillo Rose.